Maximum size: about 24 mm. Identification: This is a bright, red-orange species with fine papillae forming low ridges and brown mottling on its branchia. Natural history: Diaulula sp. #1 is known from a single animal. 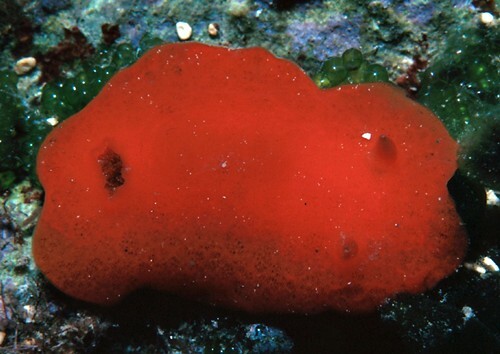 Taxonomic notes: First recorded in Hawaii at Pupukea, Oahu by Scott Johnson on May 28, 1978. Photo: Scott Johnson: about 24 mm: Pupukea, Oahu; May 28, 1978.